Summary: A good week! We still need more workers but we're making progress. Our good friends from Vamp arrived and Kim spent several days helping us with our mast wiring and offering us the benefits of his considerable boat building experience. For the mast we bought the extra tinned wire we need as well as several lengths of PVC conduit to hold the mast wiring. The PVC was slit to go up the internal mast tracks, and diamonds were cut out of it to go around the bolts which protrude into the track for the conduit going to the masthead. Cruising friends have offered us their scooter, so we retrieved it from Yacht Haven at the top of Phuket Island. This will make it much easier to nip out quickly for tools and supplies. Sue and Golf bought some more foam and epoxy so we have the immediate supplies we need. 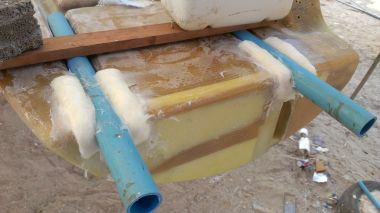 The swim ladder grooves were glassed in and the swim ladder mounting areas were routed out and filled with solid fiberglass. The walls coming down to the swim platforms had foam sheets epoxied to their tops so they come down at the ends of the swim platforms. Our new worker, Mee, removed a plywood backing plate from inside the targa bar and replaced it with solid fiberglass. Then he cut out the shelves to go above our forward port‑lights - our "eyebrows" - and glass wrapped both the supports and the shelves themselves. We had a good discussion with Golf about money and the future of the project, so we're feeling cautiously optimistic. A slow day, as Jon still isn't feeling top notch, and Golf wasn't at the boatyard for very long. We spent much of the morning with our dear friends from Vamp, who have just sailed all the way back across the Indian Ocean (5,000nm) to spend more time in SE Asia with us. Kim is an expert boat builder, having built at least 3 cruising boats over the years, and he's offered to help us for a few days. With so many areas of Ocelot still needing major work, it was hard to pick just a single area for Kim to help with. We finally decided on the mast. We have to run new wires up the mast, and those wires have to go inside a new conduit, which has to be fastened to the inside of the mast somehow. Kim says it's easier to do this than to explain how, which is probably an exaggeration but is still welcome news. So tomorrow we have a date with Golf to go shopping for all the bits and tools we need for the job so Kim and Jon can start bright and early Wednesday morning. The major accomplishment today was that Houa and Kao glassed in the starboard swim ladder grooves. Jon had talked at length with Houa and Golf about how he wanted this done, which had resulted in much Thai between Golf and Houa. 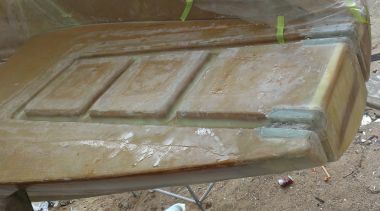 Houa had glassed in the port‑side grooves by filling the swim ladder mounting area with epoxy mud and glassing it over, rather poorly. 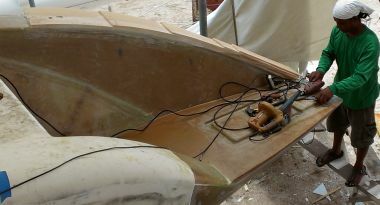 This area will now have to be ripped out with a router, filled with strips of fiberglass, and then glassed over again. Jon wanted the ends of the grooves, where the swim ladders bolt down, to be routed out and filled with fiberglass before the grooves were glassed in, so we could avoid the whole ripping out process. We're still not sure why Houa wanted to glass the grooves and then rout out the glass and epoxy mud from the swim ladder mounting area and do that whole area a second time, but that's what Houa did, just like the port side, despite having been specifically asked not to. 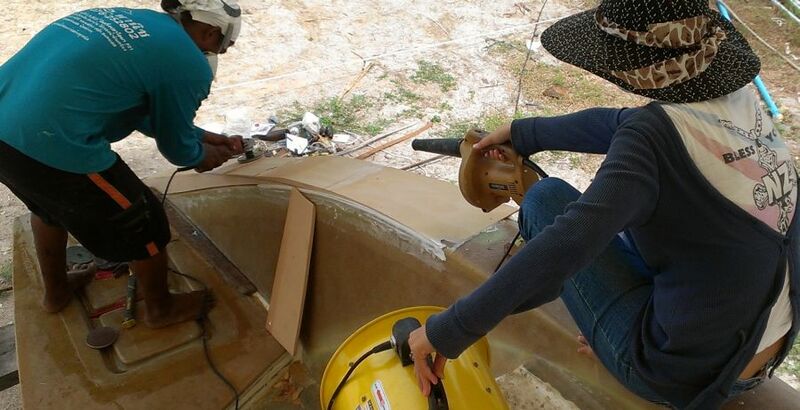 Kao stayed on a few more hours and did a good job of sanding down many of the areas that have been newly glassed, like the targa bar, the old grab‑rail troughs, and the glass holding the instrument console on. These areas should now be almost ready for getting their final gelcoat. Kao also ground back some gelcoat up forward where an exploratory cut made months ago needs to be repaired. 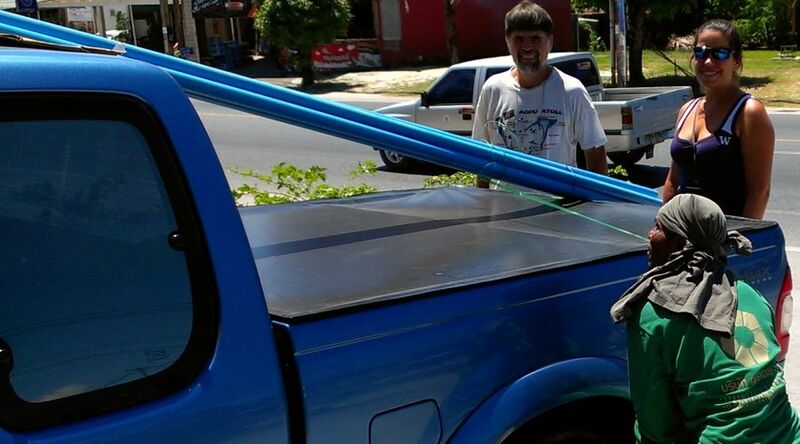 On the way home, Sue and Jon stopped by a few hardware stores to see what sort of conduit was available for the mast. We'll probably use 2 lengths of conduit, one going about half way up the front of the mast for the radar, foredeck lights, and navigation lights. Then we'll run a second wiring conduit up the back of the mast all the way to the masthead for the VHF radio antenna, tri‑color lights, and wind instruments. 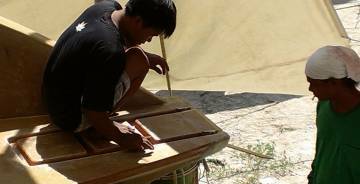 The wind instrument is the only real concern, as it uses special wiring (5 strands plus a shield) that may be hard to find in Phuket. Bit of a disappointing day of work on Ocelot, but Jon, Sue and Amanda accomplished a fair amount. Golf is still suffering from a bit of a cold, but stayed at work all day. He's hired another young worker, who was put onto polishing the mast. Even better, our old worker Bow, who did much of the original work on the transom extensions (including building the walls going down to the swim platforms) has apparently agreed to come back to work for us. Houa came back from his little hissy‑fit yesterday, ready to work but unable to look Jon in the eye. 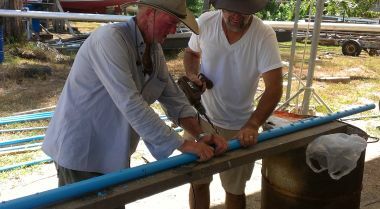 In preparation for Kim helping Jon on the mast, we borrowed Golf's music truck to buy supplies: PVC pipe, pop rivets, drill bits, and wire. The PVC pipe will become a pair of conduits inside the mast to protect our electrical wires from the ropes, a 1¼" (nominal, but actually closer to 43mm ID) conduit going up the back of the mast to the masthead, and a smaller 1" (nominal, but closer to 27mm ID) conduit going about half way up the front of the mast for the radar and various lights. The pop rivets will hold the conduits to the inside of the mast, and the drill bits are to drill the holes for the pop rivets. After a delightful lunch of fried chicken in the cool shade of our private beach, we headed into Phuket town to visit Luck Engineering, the folks who are dong all our welding and stainless steel work. They will be back on Ocelot as soon as we tell them that the new walls down to the swim platforms have been finished and they can (re)make the hand‑rails that go on top of those walls. Then we drove to Phuket Marine near Sirey Isand, where we found some good, tinned electrical wire. We'd brought a fair amount of good quality tinned wire from the US, but now we've decided to run a spare wire to each of the 4 places where wires come out of the mast. This is in case a wire somehow breaks - we'll already have a spare wire ready to hook up. This required buying the additional wire (at somewhat staggering cost) which will be delivered by 10am on Thursday. We will also run nylon lines inside both conduits, ready to pull more wires through if necessary. The conduits will only be about half full, so there should be plenty of room for future expansion. From town we drove 1 hour north to Yacht Haven where we picked up a friend's motor scooter. Jon drove it back to the yard while Sue had the thrill of Thai driving in Golf's truck. All arrived safely, despite the rush hour traffic! And now we've got a scooter for running small errands, buying bits and pieces for Ocelot, and riding the 2km between the boatyard and our apartment. At the yard we had hoped to see a lot of the mast polished, ready to receive pop rivets tomorrow, but it was hard to tell where the work had happened. Back on the transoms the guys dug out the epoxy that Jon had complained about, and we had hoped to have nice solid epoxy and glass areas ready for bolting the ladders in place. It was a big disappointment to find that instead of solid glass, they'd just mixed some fiberglass strands into their epoxy mud and smeared that into the prepared areas. The epoxy had gone into thermal runaway, which produces a lot of gas bubbles inside the epoxy and makes it too soft for tapping into. Now all of today's work will have to be ground out (again) and the glassing will have to start over. Big breath. Zen of Thai boat work and all that. One more day gone. Hopefully things will look up tomorrow. A reasonable day, but most of the progress came from Jon and Sue, not Golf's team. Houa spent most of the day reworking the area where the hinges of the swim ladder need to bolt into the back of the swim platform. He chipped out the boiled epoxy from yesterday's failed attempt, and then started the slow process of filling where the hinges will go with strips of fiberglass and epoxy. For some reason he insisted on using biaxial glass, even though we told him that chopped strand mat (which is much cheaper) would be fine for this application. Jon and Sue were working on the mast and made an interesting discovery. We'd thought we'd have to use pop-rivets to hold the electrical conduit to the inside of the mast, but it turns out that our mast extrusion has 3 Ts molded to the inside. These are used by slicing the conduit and snapping it over the Ts! Totally simple! We found this because 2 of the sections of conduit were still in place. They were well up the mast and pretty inaccessible, but with some persistence we were able to remove them. Our new young worker, Jeng (who is Kao's younger brother) has been working at polishing the mast, but it's been slow going. Jon tried it himself and decided that we really need a faster way, presumably with power tools. They make a nice disk now for polishing stainless steel but we couldn't find a similar (but softer) wheel for polishing aluminum. About mid‑morning Golf rounded up several other workers from around the yard and we moved our mast. It had been too close to our neighbor for us to play with stuffing long lengths of conduit up the inside, so we moved it around a bit so we have more room around the bottom. We also put old tires on top of the drums it's sitting on, so it's better cushioned and more stable. We thought we'd already stripped the mast but today we found some more fittings up at the masthead that can come off. We also worked out a way to run feeder lines for our (never before used) masthead spinnaker halyard. We'd like to get some lighter‑air sails, so getting the halyards reeved is a good first step. We brought enough halyards back from the US to run all 6 lines up the mast (from bottom to top and front to back: jib halyard, screecher halyard, small and big spinnaker halyards, main halyard, and topping lift). Good progress today! We got more (and better) workers and Sue went out with Golf and spent a bunch of money on three 12mm (~½") sheets of structural foam ($122 each) and 25 liters (26 quarts) of epoxy resin ($300 or $12/liter). All are good for productivity. Our friend Kim from Vamp spent all day helping us, which was wonderful. We worked primarily on the mast, but also discussed many other aspects of our work on Ocelot, and Kim offered good cheer (of course) and several pearls of wisdom from his many years of building boats. Kim has built a 40' Cross Trimaran in the 80s (which the family cruised on for years), their current 51' aluminum monohull in 1998, and a smaller monohull (for a friend) after their circumnavigation in 2003. We discussed several options for holding the electrical conduits to the T behind the mainsail track, and what to do about the bolts that disrupt the easy travel of the conduits up that T. We eventually decided to drill holes every 10cm (4") along the conduits, which matched up with the spacing of the offending bolts . We drilled the holes well oversize (½" or 13mm) so our measurements wouldn't have to be perfect. 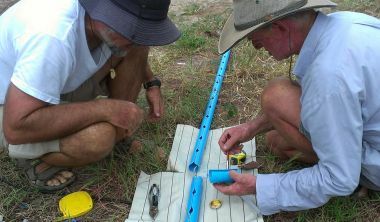 But when we tried to push our first conduit up the track, it was still very difficult - pushing 50' (15m) would have been impossible. So we used razor blades to cut the oversized holes into diamonds, so they'd slide over the obstructing bolts more easily. This took several hours - we're talking about pre-drilling, drilling, and slicing open 160 holes! Since the 5 conduit sections are 4m (13') long, we ended up with about 1.5m (5') more than we needed. So we cut off a 5' section, tied strings to each end, slathered the slot with detergent (as a lubricant), mounted it on the T, and pulled it through the length of the mast as a test. The first 2 times we tried, the conduit derailed - came off the T. But when we pulled it back out the bottom of the mast we found out why - there were 2 more old sections of conduit still up the mast! Luckily, these got caught on our strings and were also pulled out the bottom, clearing the entire track. The next several pulls were successful - the test conduit pulled all the way to the top of the mast and all the way back out the bottom again. For each test pull we slathered more detergent on the slot and each pull got easier and easier. It's still going to be a bit of a bear getting the full conduit, 10 times as long as our test piece, all the way up the mast, but it should be do‑able. Jon, Golf & Mee checking the fit of our starboard "eyebrow"
Up on Ocelot, our new man, Mee, chiseled out a section of glass covered plywood inside the targa bar, under our mainsail track. We'd replaced the plywood on port side with solid fiberglass several years ago because the wood was wet and rotten. The wood on the starboard side is still good, but it's only a matter of time before water gets in and rots it as well. Better to get rid of the wood before it gets to be a problem. Houa finished filling the 4 areas where the swim ladders will bolt down to the swim platform with fiberglass. While waiting for the epoxy to cure he started re‑contouring the port‑side wall coming down to the swim platform. Since we raised the swim platforms by several inches, the old wall no longer comes down to the end of the swim platform. Structurally it's fine, but it looks goofy. By the end of the day Houa had cut and epoxied down 5 staggered sheets of foam on top of the port wall. They still need to get shaved down to the correct profile and covered in glass, but this is excellent progress, as we've waited for those walls to be corrected ever since we raised the swim platforms. A good day, albeit a bit slower than hoped on our mast wiring project even with all the wonderful help from Kim. Up on the boat things moved along with our 2 top‑level skilled workers, Houa and Mee. Our new worker, Mee, looks like he's going to be very good. 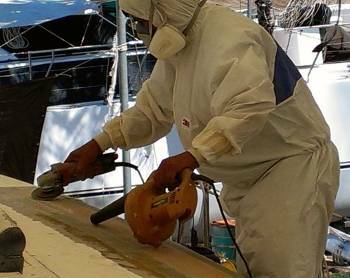 He finished chiseling out the old plywood backing plate under the mainsail track up in the targa bar, epoxied together a nice firm (inorganic) fiberglass backing plate and glued that in place. Then he turned his attention to the foredeck. 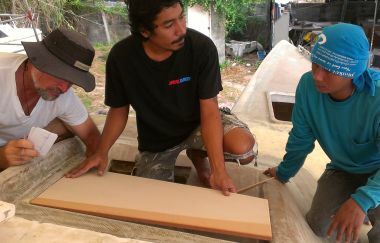 He cut foam for what we call the "eyebrows", the small step extensions that used to be made of teak over the forward port‑lights. Part of the boat de‑struction was removing the teak strips that were installed there in 2003 when we were in the Galapagos. With Mee's work, we'll have the same eyebrows now in foam and fiberglass, looking like extensions of the cabin top but with no screw holes into the fiberglass. Mee built foam brackets to hold up the new eyebrows. Hoau and Golf worked on shaping and mudding the outside wall on the port sugar‑scoop, bringing the wall down right to the back of the swim platform. 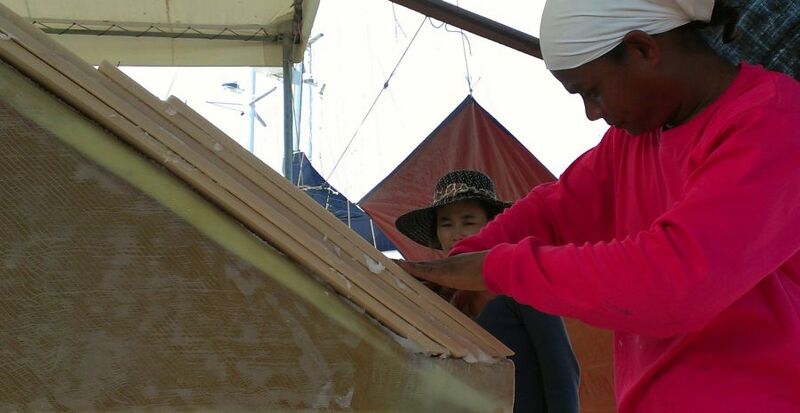 Then then began the foam laying process on the starboard side wall. It's all shaping up nicely, but it's been a longer process than we envisioned when we decided to raise the floor of the sugar‑scoops back in May. The goal on the sugar scoop extensions is to have them look organic, like they were original parts of Ocelot. We're getting there! Amanda joined us at the boatyard first thing in the morning and she had the fun of playing "pull the conduit through the mast" with Jon. The conduit behind the mainsail track has to bounce over 160 bolts on its way to the top of the mast, and we've found that running the sections along the track several times makes them slide more easily. We're going to need all the ease we can get when we push the final, full length conduit with all the wires in it up the mast, but it's hot, tiring, and time consuming work. Once Kim arrived Amanda and Sue took off in Golf's truck to get bits and pieces from the workshop/storage room. 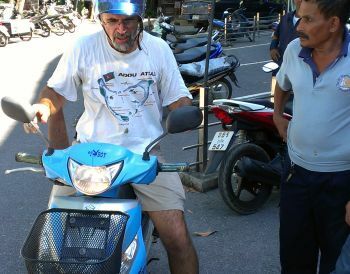 Sue's getting used to driving in Phuket, now! Mee needed one of the forward port lights from the salon to be sure the rim fit before he glassed around the eyebrow area, and Jon will soon be installing pad eyes in the bows for our new prod. It's great to be thinking about what hardware goes where. It means we're finally approaching the phase of putting Ocelot back together! After the workshop run Amanda went back to her apartment to work on the computer drawings of the bimini and sugar‑scoop steps, and to have a last day with her good friends Katrina and Rachel. When Kim got to the yard he and Jon ran the last of the 5 sections of 1¼" conduit up inside the mast, and then we began the process of cementing the 4m (13') sections together. We originally made the mistake of using joiner pieces that were too short, and given the amount of flex and twist in the long sections, the first joins let go just while moving the pipe to align the other pieces. Thank goodness for the motor scooter. Jon was able to dash to the hardware store up on the main road and buy longer joiner sections which seemed to do the trick. Jon and Kim finished the day with 18m (60') of blue conduit, all neatly slit and drilled with diamond‑shaped holes, laid out on the ground next to the mast. Next step: run the wires and fasten them down inside the conduit, and then install the wire‑filled conduit into the mast. Fingers crossed! Our friends from Vamp left this morning to go to Langkawi, so we'll miss Kim's help on Ocelot. We did have a fairly productive day, though, and all in all it was a good end to our second week back in Thailand. Up on the bows, Mee continued to work on the "eyebrows". He glassed in the brackets to hold the steps, and he got a full wrap layer of glass on the foam steps themselves. He seems to work pretty steadily and independently, so that's great. Back on the sugar scoops, Houa spent the morning sanding down the foam and epoxy filler to give us a nicely shaped wall on the port side. It's going to be beautiful! Then he and Golf used more micro‑balloons and epoxy mud to fill in spaces between the foam layers. They also smeared in some of this easily sandable mud on the outside of the wall to fill the slightly concave section so it will follow the natural curve of Ocelot's hull. 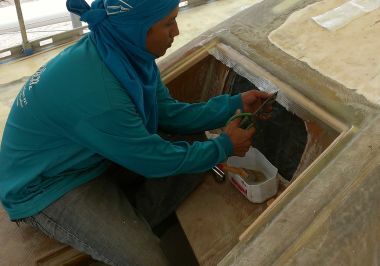 Houa's afternoon work was mainly on the starboard extension wall, shaping and sanding the foam to meet the sugar scoop floor at the very back. This will make the 2 walls the same. He also cleared out the ladder channel so we'll be able to bolt the swim ladders into epoxy and fiberglass, not just epoxy mud. Amanda and Jon spent much of the morning in conference about the mast. We have an opportunity here to reposition the 5 halyards (mainsail, jib, screecher, small spinnaker, big spinnaker) and the topping lift, so we worked out the best system to accommodate all of the lines and where they would run, and which winches they would go to. A pretty fun exercise, especially with Amanda who knows the boat so well. We decided not to lay the new conduit in the mast with the wires until we have had a chance to put a finish on the mast, so that the wires aren't at risk of getting damaged or in our way. Our young worker, Kao, was back, and he was his usual cheery self, moving from job to job as a gofer and epoxy mixer. His brother, Jeng, should return on Monday, and possibly another fiberglass man as well. Shortly after lunch Jon and Sue took Golf out to a new air conditioned coffee shop where we could sit comfortably in a neutral space with the coffees of our choice. The goal was to hash out the remaining projects still to be done on Ocelot, set a finish date (November), and work out what it might cost us to go forward from here. It was an amicable conversation, and we're all feeling happier and more optimistic about things now. 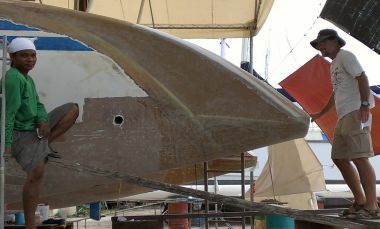 In a nutshell, Golf realizes his responsibility and is getting a bank loan to carry the work forward, but he wants us to pay for some materials, like the foam, epoxy, and fiberglass for the bimini. We are cautiously optimistic that we'll come out of this big project not TOO terribly over budget. Golf claims that some of our projects, especially the sugar‑scoops and the bimini, have expanded considerably past what he'd originally quoted on, which is true enough. Of course we all realize there could be more hiccups and snags, but at least we're all on the same page when it comes to the work still to be done and who will pay for what. We were happy to hear that Golf does indeed have all our teak and the gelcoat needed to finish the beautifying of Ocelot. In the middle of our conversation with Golf the heavens opened, lightning flashed, thunder boomed, the wind whipped the rain into a frenzy, and we all sadly noted the first big downpour of the fall rainy season. We got back to the yard at the end of the deluge to find the workers busily covering things in plastic and generally picking up for the end of the day, which was fine with us. Being Saturday, we produced beers and soda and chips and had a few minutes of relaxing fun with the workers under Ocelot's bridge deck before everyone got paid and headed off for home on their motor scooters.